Tonnages: 14,885 gross 8,802 net 23,310 deadweight. 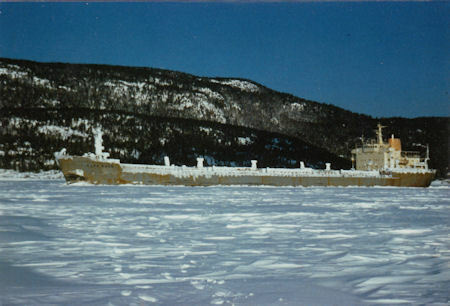 January 1971: Completed by Kaldnes A/S Tønsberg (Yard No. 186) for Lyle Shipping Co. Ltd.,Glasgow. Scottish Ship Management Ltd., Glasgow, managers. Time chartered to Alcan (Bermuda) for ten years. Maiden Voyage: Tønsberg to MacKenzie, Guyana. Loaded bauxite for Port Alfred. 1986: Management to Denholm Ship Management, Glasgow. Bermuda flag, renamed NORTHERN PIONEER. 1990: Sold Silver Cross S.A., Golden Union Shipping Co. S.A. managers, Greek flag, renamed FLAG EVA. 1995: Sold Seabulk Marine Services SA, Seabulk Shipping SA, Panama, managers. Panama flag, renamed SEAQUEEN. 1996: May 16th laid up at Eleusis, Greece. 2002: 27th September, arrived at Aliaga, Turkey under tow, for breaking up.